Dan Christensen's digital marketing portfolio. Provides work samples, digital media creations, infographics, case studies & marketing reports. Dan Christensen is a digital marketing freelancer, providing digital media, SEO, keyword research, social media and online advertising to small businesses, brands & agencies. Posting daily social media content. Designing graphics and writing blogs. Writing SEO web copy for landing pages. The company’s website appeared 1st on SERPs for “interior design” in target locations. Social media pages grew, attracting new customers to the website. Increased site traffic, leads, and online bookings through SEO, content marketing and social media marketing efforts. To promote the opening of a new arcade and restaurant in Tampa, for GameTime, Dan developed a one-day special event, offering free video game play. Buying media spots on television and radio and producing commercials. Designing promotional event logo, in-store collateral, direct mailers and flyers. Advertising on Google AdWords and Facebook. Writing press releases and doing interviews with local media. Over 5,000 customers entered the arcade on the day of the event, with a line of 100 people waiting outside before the doors opened. The most-profitable day of the year for the sports bar and restaurant; because customers didn’t spend money on games, they spent more on food and drinks. An increase in overall store visits in the months following the event, along with a huge jump in party bookings for the holidays. Digital marketing is the strategic collaboration of web marketing and online advertising. SEO portfolio for digital marketing freelancer shows: keyword research, competitive analysis, analytics & site optimizations. To execute effective SEO strategies, brands should utilize competitive and targeted keywords to attract organic search discovery, improve site engagement, and obtain backlinks from other sites with authority. Competitive report for eCommerce website, analyzing targeted competitor’s websites and SEO strategies. Provided SWOT analysis, keyword recommendations and competitor’s overall SEO performance. Built a report that provides researched suggestions for SEO improvement and analyzes the competitive landscape. Social media marketing portfolio for digital marketing freelancer shows the content, pages and brands managed across social media platforms. Shows post samples & performance reports. Engaging with users & social influencers to promote organic growth, improve organic discovery & expand social reach. Researching target markets, establishing audience profiles, measuring social analytics & developing content marketing campaigns to draw engagement. Writing copy for posts, advertisements, profile pages & comments, while maintaining a consistent brand voice across channels. Designing graphics, images, logos, headers, icons, post content, online videos, memes, GIFs & image galleries. Managed Facebook Advertising campaigns for Waldorf Private School; running social media media advertising campaigns; promoting events & obtaining registrations. Built audience profiles, designed graphics for posts and videos, wrote ad copy and generated leads through site visits and online signups. With only a $5/day budget, ad campaigns achieved their objective of driving traffic to the website, encouraging them to register and build awareness for the school on Facebook. UK-based interior design company needed social media marketing, including daily posts on Facebook, Twitter, Google+, LinkedIn and Pinterest. Created social media pages on Twitter, Google+, LinkedIn & Pinterest. Designed graphics, posts, logos, icons & headers. Wrote post copy & completed weekly analytics reporting. Engaged with users, relevant communities, groups & followers. All social media pages, including Facebook, Twitter, Google+, LinkedIn and Pinterest, grew in followers, drove traffic to the website and generated leads through online bookings and direct calls. Content marketing portfolio for digital marketing freelancer shows work with: web design, blog writing, graphic design, copy writing, online video creation & digital media production. Content marketing is the creation of engaging digital media and online content. Engaging content provides something of value to the user, in exchange for a target action or response. Effective content marketing strategies include developing creative marketing plans, designing calendars & digital strategies for growing brands online, through social media & on community forms. Shortly after BecauseYouGoogledMe.com launched, and the BYGM brand started taking shape, Dan designed a resume that illustrated and highlighted his experience and work history, along with his creativity, design and branding skills. 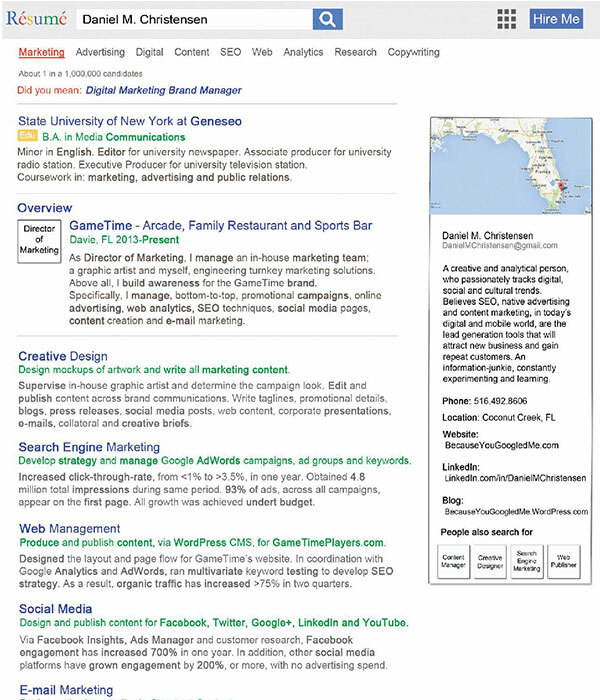 The resume was designed to match the appearance and layout of a Google SERP (Search Engine Result Page). From the search bar on the top and mock ad, to the formatting and color scheme, all elements were designed to match the appearance of the Google SERP, while also providing all the relevant information typically found on a resume. The goal of this resume design was to promote the skills Dan had that went beyond the words on a page; rather than simply tell the reader what Dan has done, the resume would illustrate the work Dan could do. The holiday promotion offered an entire day of free arcade game play to all guests that were in attendance on this day. The goal of the event was to raise awareness for a recently opened GameTime location in Tampa, FL. The campaign objective was to get as many guests in-store, on a single day, to promote and raise awareness for the business. One of Dan’s responsibilities as the Director of Marketing was to provide creative direction to the graphic artist. Dan designed mock-ups, delivered creative briefs, wrote copy and provided final approval on all marketing collateral, logos and designs. As the Director of Marketing for GameTime Arcade, Restaurant & Sports Bar, Dan was responsible for creating video content that would be uploaded to YouTube. Without a budget, access to video editing software, and with a quick turnaround time, Dan produced several short, online videos. The videos advertised GameTime’s promotions, specials and features. Because there were was no access to video footage, the online videos used various images to highlight the promotion. These videos allowed GameTime to create a YouTube page, fill it with some initial content, share videos on its website and social media pages, and start working on additional videos in the future. A Creative Content Marketing Strategy: Case Study details the background, problem, solution and results that were experienced during the process of creating the videos. Pay-per-click (PPC) advertising portfolio for digital marketing freelancer includes: online advertising campaign samples, display designs, ad copy & campaign results. Pay-per-click (PPC) advertising campaigns are managed on Google AdWords, Bing Ads, Facebook, Twitter and LinkedIn. Kimberton private school near Philadelphia hired Dan to manage ongoing Google AdWords campaigns, to promote admission registrations and summer camp programs. Developed Google AdWords advertising campaigns, wrote ad copy, designed graphics for display ads, reviewed Google Analytics and optimized campaigns for bidding and remarketing. Waldorf school needed Google AdWords campaigns developed, to gain website traffic, promote events, encourage users to call and increase awareness of Philadelphia private school. In April, 2016, the school held an Open House, which was advertised on Google and Facebook. Advertising campaigns set out to generate sign ups, schedule appointments and acquire email addresses for drip campaigns. The April Open House advertising campaigns acquired 1,000 site visits, was seen by thousands of local targeted leads and helped to increase social media follows and better search rankings. The Email marketing portfolio includes email design samples, newsletters & promotional emails created by Dan Christensen & kantspelle marketing. Email marketing campaigns are built using a variety of email marketing programs, such as MailChimp and Constant Contact; other emails designed using html. Copy and graphics designed by Dan, including the content, blogs and images within each email. A collection of emails designed for various brands. Emails are designed using Constant Contact, MailChimp, iContact, and html. Includes drip campaigns, newsletters and promotional messages. Blog writing samples from Dan Christensen. Blogs written & published by Dan Christensen & kantspelle marketing, for small businesses & brands. Blog samples written for businesses and brands, across multiple industries. All blogs written using target keywords, optimizing for web, publishing to the website, graphic design and branding. View any of Dan Christensen's blog samples by clicking the connected button below. Also take a look at BecauseYouGoogledMe Blog, Dan Christensen's personal blog, for more samples of blog and article writing. Excerpt: "Break from the same old routine and get on the ballroom dance floor!" Excerpt: "Most women entrepreneurs have a mission and purpose to help others reach their goals." Excerpt: "The Magento 2.0 upgrade comes with a host of improvements “to performance, scalability, security and compatibility." Excerpt: "Fitness Boot Camp isn’t just for workout experts, it can get everyone in shape." Excerpt: "If you’re not actively protecting your Magento site, every single day, and taking the proper steps to eliminate security vulnerabilities and flaws, you’re putting your entire site at risk." Excerpt: "We’ve gathered a few of our favorite recipes for cooking with, of course, beef jerky. " Excerpt: "Daphne lost 25 pounds with the help of Kay and her Sweet Life Wellness coaching program." Excerpt: "Let’s be honest, not all Olympic sports require an incredible amount of athletic ability. " Excerpt: "Since 1983, David Hampton has been providing superior leather goods and gifts for men and women around the world."